Juan Carlos I is a multi-purpose amphibious assault ship-aircraft carrier in the Spanish Navy (Armada Española). Similar in role to many aircraft carriers, the ship has a ski jump for STOVL operations, and is equipped with the AV-8B Harrier II attack aircraft. The vessel is named in honour of Juan Carlos I, the former King of Spain. The new vessel plays an important role in the fleet, as a platform that not only replaces the Newport-class LSTs Hernán Cortés and Pizarro for supporting the mobility of the Marines and the strategic transport of other ground forces, but also acts as a platform for carrier-based aviation replacing the now withdrawn aircraft carrier Príncipe de Asturias. The design for the Buque de Proyección Estratégica (Strategic Projection Vessel), as it was initially known, was approved in September 2003. The vessel has a flight deck of 202 metres (663 ft), with a ski-jump ramp. The ship's flight deck has eight landing spots for Harrier, F-35 Lightning II or medium-sized helicopters, four spots for heavy helicopters of the CH-47 Chinook or V-22 Osprey size. The ship can carry either 30 helicopters or 10/12 McDonnell Douglas AV-8B Harrier II or Lockheed Martin F-35 Lightning II and 10/12 helicopters, using the light vehicles bay as an additional storage zone. For the first time in the Spanish Navy, the ship uses diesel-electric propulsion, simultaneously connecting both diesels and the new technology gas turbine powerplant to a pair of azimuthal pods. The complement of the ship is around 900 naval personnel, with equipment and support elements for 1,200 soldiers. Multi-functional garage and hangar space on two levels covers 6,000 m2 (65,000 sq ft), with capacity for 6,000 tonnes load on each level. A stern well deck measuring 69.3 by 16.8 m (227 by 55 ft) can accommodate four LCM-1E landing craft which can beach-deliver non-swimming ground vehicles like tanks and four RHIBs, or one Landing Craft Air Cushion plus Assault Amphibious Vehicles. Construction of the 231 m (758 ft), 27,000-tonne ship started in May 2005 simultaneously at the Navantia Shipyards in Ferrol, Galicia (with the cut of the first plate corresponding to Block 320) and in Fene, Galicia (with the cut of the first plate corresponding to Block 330). The ship, that supposes a service load of 3,100,000 hours of production and 775,000 hours of engineering, was launched 10 March 2008, and was commissioned 30 September 2010. The original budget was €360 million but the ship cost €462 million (US$600 million) in the end. Following a lengthy design contest that pitted the design against the similar but smaller French Mistral-class amphibious assault ship, the Prime Minister of Australia announced on 20 June 2007, that Australia would purchase and build two ships of the same design to become the Canberra-class landing helicopter docks. Navantia was responsible for construction of the ships from the keel to the flight deck in Spain, after which the hulls were transported to Australia for completion by BAE Systems Australia. The first of these ships HMAS Canberra was commissioned on 28 November 2014, the second ship HMAS Adelaide was commissioned on 4 December 2015. Both commissioning ceremonies took place at the Garden Island naval base in Sydney. The internal fit out of Canberra and Adelaide differ from Juan Carlos I, and are not equipped to deploy with or support fixed-wing fighter jet aircraft. In September 2009, Russia invited Navantia to take part in the competition to supply Russian Navy with the new generation of amphibious assault ships to compete against the French Mistral-class ships. In January 2011 Russia chose the Mistral design over the Spanish concept. Navantia will provide design, technology transfer, equipment and technical assistance to Sedef Shipyard of Turkey for the design and development of TCG Anadolu (L-408), a heavily modified Turkish derivative of the Juan Carlos-class LHD. The derivative is classified as a "Light Aircraft Carrier/LHD" by Turkish Lloyd. The Turkish Navy variant will be built in Turkey by Sedef and feature Turkish command and control systems. Combat system will be integrated by Aselsan and Havelsan. In December 2013, the Turkish LPD/LHD program was estimated to cost € 375 million (US$500 million). According to the original plan, the Turkish Navy wanted a slightly shorter flight deck without the ski-jump ramp in front, to be optimized for use with only helicopters. However, the Turkish Navy later changed its plan and opted for a fully equipped flight deck with the ski-jump ramp in front, after deciding to purchase F-35B STOVL aircraft. Turkey is a Level 3 partner in the Joint Strike Fighter program and the Turkish Air Force will get the F-35A CTOL version. The Turkish version of the LHD will be capable of operating up to 12 F-35Bs and 12 helicopters in "light aircraft carrier" configuration. The dimensions of the final design are: 232 meters (length), 32 meters (beam), 6.9 meters (draught), and 58 meters (height). Its displacement will be 24,660 tons (in "light aircraft carrier" mission configuration) or 27,079 tons (in "LHD" mission configuration). Its maximum speed will be 21.5 knots (in "light aircraft carrier" configuration) or 29 knots (in "LHD" configuration); while its maximum range will be 9000 miles at economical speed. It will have a 5,440 m² flight deck and a 990m² aviation hangar which can accommodate either 12 medium size helicopters or 8 CH-47F Chinook heavy-lift helicopters. (When the aviation hangar and the light cargo garage are unified, the ship can carry up to 25 medium size helicopters. Alternatively, the ship can carry up to 12 F-35B and 12 helicopters. Six more helicopters can be hosted on the flight deck of the ship.) Additionally, the ship will have a 1,880 m² light cargo garage for TEU containers and 27 Amphibious Assault Vehicles (AAV); a 1,165 m² dock which can host four Landing Craft Mechanized (LCM) or two Landing Craft Air Cushion (LCAC), or two Landing Craft Vehicle Personnel (LCVP); and a 1,410m² garage for heavy loads, which can host 29 Main Battle Tanks (MBT), Amphibious Assault Vehicles and TEU containers. The ship's crew will consist of 261 personnel: 30 officers, 49 NCOs, 59 leading seamen and 123 ratings. The final contract for the construction of the ship was signed with the Navantia-Sedef consortium on 7 May 2015. The commissioning of the ship is scheduled for 2021, and the estimated cost of the ship according to the final specifications is $1 billion. The construction works began on 30 April 2016 at the shipyard of Sedef Shipbuilding Inc. in Istanbul. ^ a b Ministerio de Defensa (September 2011). "Evaluación de los Programas Especiales de Armamento (PEAs)" [Evaluation of the Weapons special programs] (PDF) (in Spanish). Madrid: Grupo Atenea. Archived from the original (PDF) on January 17, 2012. Retrieved 30 September 2012. ^ "El 'Juan Carlos I' sale a la mar para las primeras pruebas de navegación" [The Juan Carlos I goes to sea for the first navigation trials] (in Spanish). El Correo Gallego. 22 September 2009. Retrieved 5 November 2014. ^ a b "Lleva el nombre de 'Juan Carlos I'" [Sports the name of Juan Carlos I] (Press release) (in Spanish). Ministerio de defensa. 30 September 2010. Retrieved 23 May 2015. ^ "Navantia acaba pruebas de mar en "Juan Carlos I" y planea entrega el 24 junio". Finanzas (in Spanish). 2 June 2010. Retrieved 5 November 2014. ^ a b c d e f g h i "LHD Juan Carlos I". Spanish Ministry of Defense (Armada). 2014. Retrieved 2014-07-10. ^ a b "LHD Juan Carlos I Technical data". Armada. Retrieved 8 November 2015. ^ "Spanish Navy receives its largest warship 'Juan Carlos I'". Brahmand.com. 4 October 2010. Archived from the original on 23 September 2015. Retrieved 23 April 2015. ^ "LHD Juan Carlos I (Mission profile)" (in Spanish, English, and French). Spanish Ministry of Defense (armada). 2007-10-28. Retrieved 2008-10-10. ^ "Alonso elude concretar si el Gobierno contratará una sexta fragata F-100 para Navantia". La voz de Galicia (in Spanish). 28 October 2007. Retrieved 23 May 2015. ^ "El buque 'Juan Carlos I' concluye con éxito sus pruebas de mar y podrá ser entregado a la Armada el 24 de junio" [The Juan Carlos I ship concludes successfully her sea trials and can be delivered to the Navy at June the 24th]. 20 minutos (in Spanish). 2 June 2010. Retrieved 5 November 2014. ^ "Navantia and local partner selected by Turkey for construction of one LPD based on the Juan Carlos I" (Press release). Navantia. 27 December 2013. Retrieved 23 May 2015. ^ "Turkey selects Navantia's Juan Carlos LHD design as winner of its LPD tender". Navy Recognition. 28 December 2013. Retrieved 23 May 2015. ^ "Navantia and SEDEF Join Forces to Construct LHD and LCMs for Turkish Navy". World Maritime News. 7 January 2014. Retrieved 23 May 2015. ^ "Model of the Turkish variant of Juan Carlos I (L-61) class LHD". Dartmouth Centre for Seapower and Strategy, Plymouth University. 11 May 2015. Retrieved 11 November 2015. ^ "Turkey's Future LHD Could Be Modified as an "Aircraft Carrier" to Deploy F-35B Jets". Navy Recognition. 2 January 2015. Retrieved 23 May 2015. 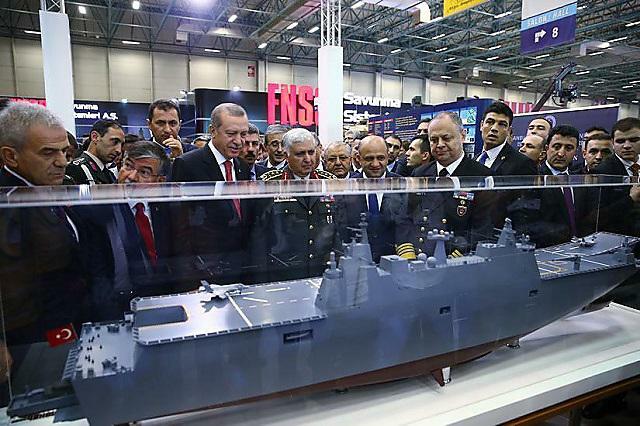 ^ "Turkish Navy Future LHD Model Showcased with F-35B STOVL Aircraft at IDEF 2015". Naval recognition (Press release). ^ "Turkey Selects Local Shipyard for LPD Contract". Defense news. 29 December 2013. Retrieved 5 November 2014. ^ a b c d e f g h i j k l m n o p q r "Turkey signs contract with Navantia-Sedef for the construction of a light aircraft carrier", Dartmouth Centre for Seapower and Strategy, Plymouth University, 11 May 2015. ^ a b c "The Contract For LPD Construction Has Been Signed", Bosphorus Naval News, 19 May 2015. ^ a b "Turkey Started the Construction of its future LHD TCG Anadolu". Navy Recognition. 2 May 2016. ^ a b "The Construction of The Multipurpose Amphibious Assault Ship TCG Anadolu Has Started". Bosphorus Naval News. 2 May 2016. 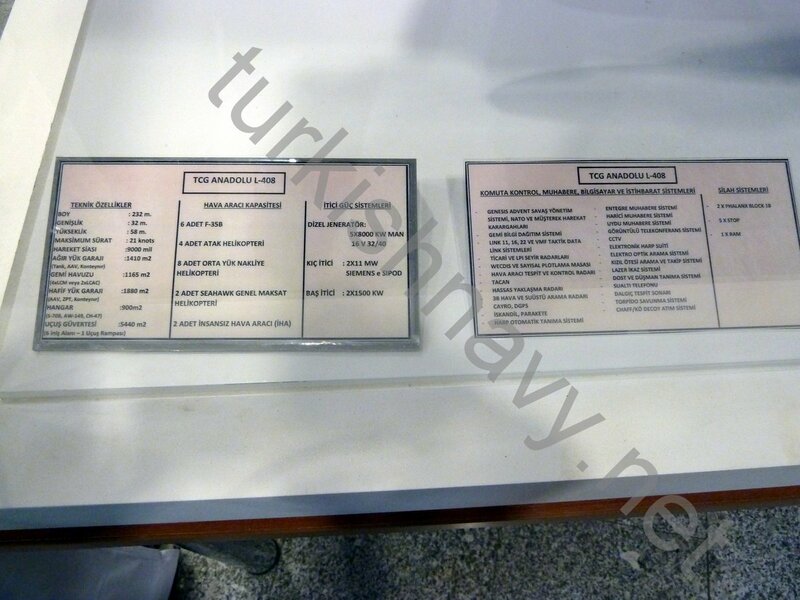 ^ a b "Technical specifications of TCG Anadolu (L-408)" (JPEG). TurkishNavy.net. 2 May 2016. ^ a b "Havuzlu Çıkarma Gemisi 2021 yılında Deniz Kuvvetleri'ne teslim edilecek", Denizhaber, 7 May 2015. ^ "First steel cut for Turkish LHD ship". Naval Today. 3 May 2016. Wikimedia Commons has media related to Juan Carlos I (L-61).